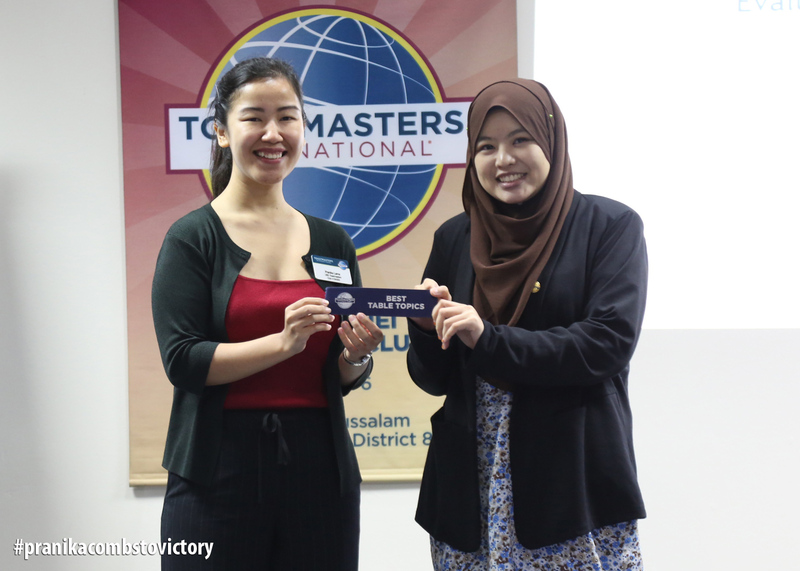 The audience gave a thunderous clap in response to 'Thought of the Day' by our Immediate Past President, Jordan Yau, CC, who was the Toastmaster of the Evening (TME) on 25th July 2017. His old friend once said, “Trust your instinct.” It does not matter what people do or what they think, just trust yourself. 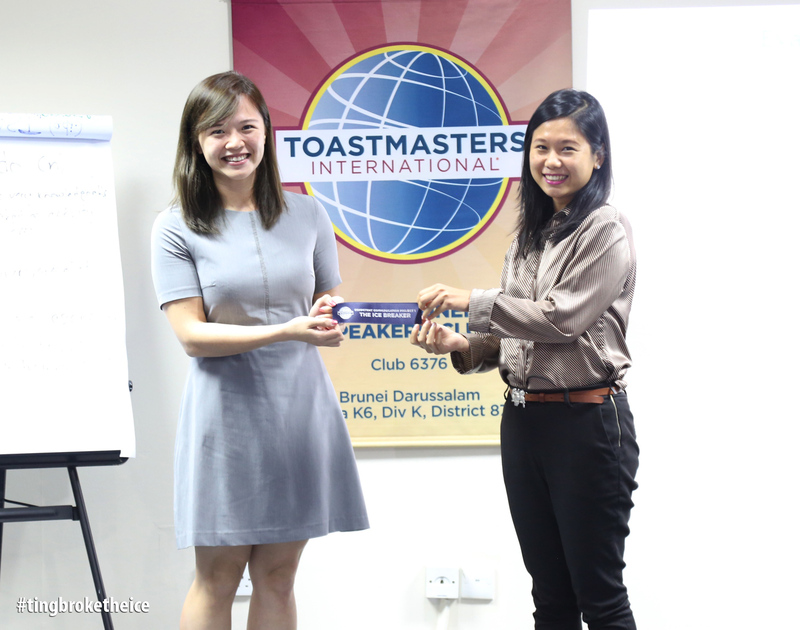 "Smile to calm nervousness before presenting a speech"
TM Wong Hui Ting delivered her Ice Breaker speech with the title 'You are not what you study'. She asked the audience on whether we are on our way to achieving what we want in life. Hui Ting grew up studying in an international school and from there, she developed different combinations of accents while foreign teachers often pronounced her name wrong. For that reason, she asked the members to call her Ting, short and easily remembered. As a kid, her parents would often ask her what she would like to become one day and thanks to her overly ambitious personality and the influence of books, school and television shows, she aspired to become various professionals, including being a teacher to boss children around one day, but eventually she came to realize that is not what teachers actually do. Hui Ting also used to practice writing her signature hoping to one day become a famous celebrity. She also has a soft spot for pets and wanted to be the next Cesar Milan (a dog behaviorist). Later in life, she furthered her studies in the UK to attain bachelors and masters degrees in psychology. Before going back to Brunei to find a job, she did what most post-graduate students would do, which is to travel around Europe, taking pictures of landscapes, food and even cats on the streets. In Brunei, she landed her first job working in a child development centre. When her dad persuaded her to continue the family business, she quit her job to join the marketing and sales team at her family business. Picking up something foreign to her such as business after years of studying psychology was not easy for her and she questioned herself if being in business was where she wanted to be at. Hui Ting loves to revolve herself around people and seeing the people around the organization was what kept her going. It was to help people that made her pursue psychology in the first place. Hui Ting used her knowledge at her workplace such as applying principles from consumer behaviour and motivation. Hui Ting is a psychologist graduate working in the business environment. She shared with the audience that despite not working in the field she studied for, it does not mean she drifted off or wasted her time. This is because "education is merely a stepping stone of a bigger picture in life". After the break, we had the first educational talk for the term 2017-2018. 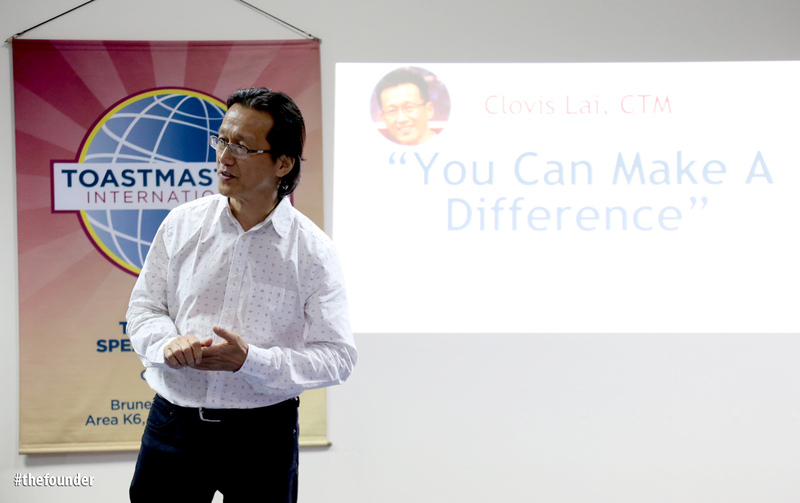 This was given by the co-founder of Brunei Speakers’ Club and the person who introduced Toastmasters to Brunei, Clovis Lai, CTM. He started off by saying, “You make a difference”. We make a difference in the careers we choose, using the resources available to us and working with the people we surround ourselves with. 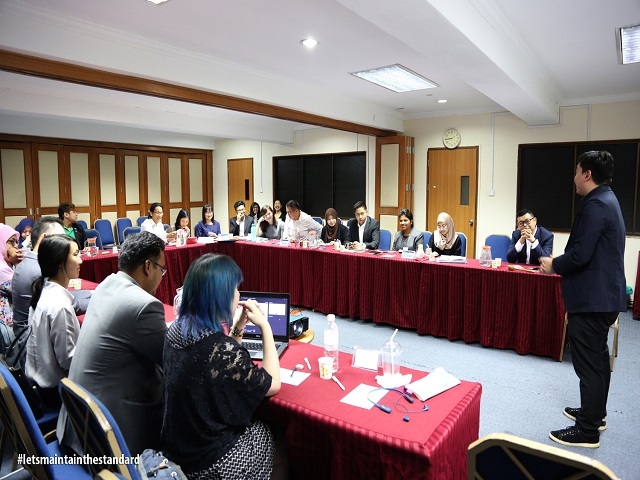 Clovis also reminisced on the days when Brunei Speakers’ Club started off with 5 members only in the year 2000 and each member wore too many hats, that is, the meeting would have an individual taking the roles of both Grammarian and Ah Counter at the same time! He praised the members who took the initiative to continue leading the club and got it out of its caveman days. Lai Ling Ling, CC, shared to the audience that she is not the nicest person. The reason for this is because she had laughed at the expense of someone else’s misfortune, whether it was seeing her brother going home from the gym, people falling or tripping, or even when her dog had a bucket over his head. Her speech was carried out with great delivery and humour. TM Sophiana Chua expressed her desire to retire soon and claimed that if she was not posting pictures upon pictures on her social media, she would dream on planning her son’s wedding one December. How would the reception turn out? What colour would be the wedding theme? What kind of food should be served? Who should she invite? In the eyes of Amran Jamaluddin, CC, his hero would always be his late father. When his father passed away 5 years ago, Amran felt he lost the only hero he would look up to. To Amran, a father cannot be replaced and Amran aims to the best person he could be in order to make his father proud. What talent do you wish you have? Farhan Jafar Ali, CC, ALB, wished for the talent to remember things. Air, water and food are the typical answers to such a question. 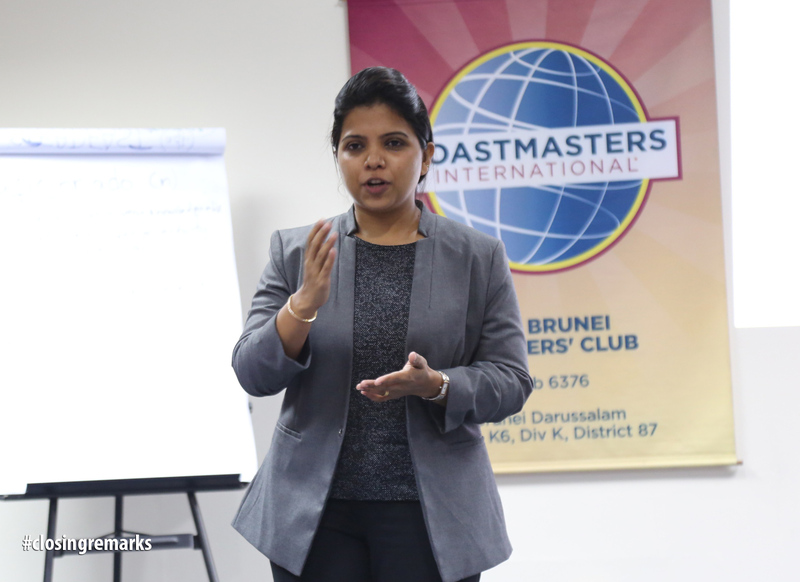 For this speech, Pranika won the 'Best Table Topics' of the evening.